Chad, 2010 , 92 min. 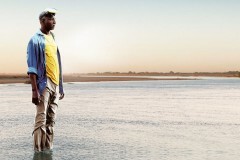 The film tells the story of Adam, a former swimming champion and local hero, who works as a pool attendant at a luxury hotel in the capital city N’Djamena. When the hotel falls under new management, Adam is demoted, and his son is hired to replace him. Adam is also too old to join the civil war still raging in the country. With his signature style of austere profundity, Mr. Haroun reveals the full tragedy of this African father’s story. Winner of the 2010 Special Jury Prize at the Cannes Film Festival.